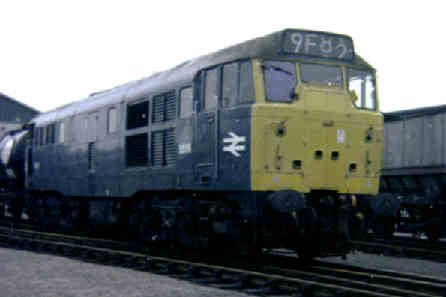 One of the types of diesel electric that was drafted in to replace the hydraulics were the Class 31's, which had 3 axle bogies, the centre one of which was unpowered. They were heavy for their power but were useful machines, some still being in service now 45 years after their first appearance, albeit with their original Mirless engines replaced with English Electric ones similar to those fitted to the Class 37s. This view is of some class 31's, including D5551, on their original home territory, the Eastern Region, at the stabling point at Kings Cross. At one time this would have been full of locos including Deltics. 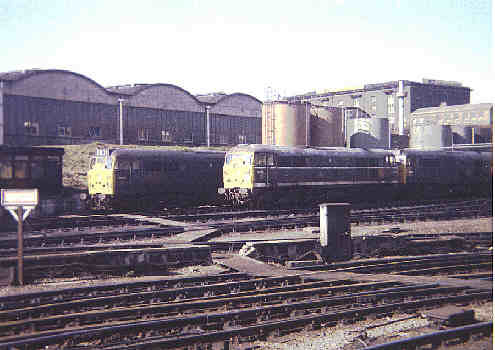 After they arrived on the Western Region Class 31's became fairly widespread, though they were based at Bristol and Old Oak Common they could be seen down in Devon and, as with D5536 seen here at an Open Day at Cardiff Canton depot, in South Wales. 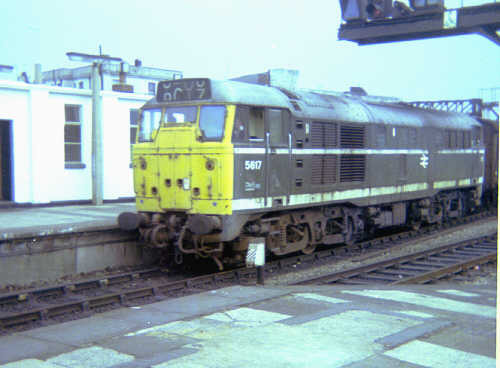 They often appeared on loco hauled local services such as Exeter to Paignton or Barnstaple as well as on freight and parcels traffic. D5617 stands in Cardiff General running light through the station. D5828 stands on Canton along with BR Type 2 D7569 and a Brush Class 4. Photos by B Tucker. Photos not otherwise credited are ©2001-2005 S G J Huddy. Other photos are included with permission of the copyright holders.